This development offers homes with 2, 3 and four bedrooms. The open plan of the homes offers excellent natural lighting, while their large windows and terraces provide the best ways to enjoy the night ambiance. The interior design is modern, functional and minimalist. The features have been carefully chosen to inspire a minimalist design: lacquered woodwork, large windows, brights spaces, a furnished kitchen and the choise of flooring for the home and tiling for the bathrooms. 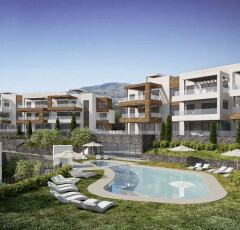 It has been built in the best location, a few metres from Saladillo Beach and a 10-minute drive from Estepona. 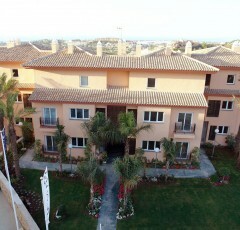 The housing development is served by two lines and night bus line, and is close to Málaga Internatinoal Airport. Estepona offers a wide range of cultural and sports activities. Its golf courses include three of the best courses on the Costa del Sol: Los Flamingos, Guadalmina and the Real club de Golf. 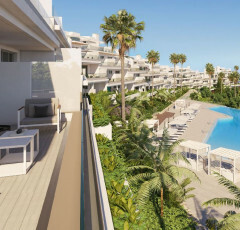 It is only a few minutes from Marbella, city whose recreational activities are unparalleled and filed with all the services you could need: supermarkets, health centres, schools, hotels, restaurants and many others. Complete hot/cold climated control installation. Heating underfloor installation in bathrooms. A totally closed-in residential complex with surrounding fence. Inside sports zone with gymnasium, paddle tennis court, outdoor circuit with outdoor equipmet, putting green outside petanque court.